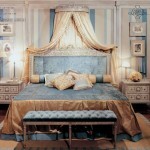 Luxury bedroom by Angelo Cappellini: 25 beds in a model of Italian historical styles XVII-XIX centuries. Back in 1886 Ambrogio Cappellini opened a small carpenter’s workshop. A century later, in 1963, his great-grandson Angelo decided to revive the family tradition. He founded a furniture factory that bears his name to this day. Thus began the story of Angelo Cappellini – famous factory for the production of luxury furniture. Bedroom production Angelo Cappellini is indeed very beautiful and luxurious. Hand embroidery, stucco, gilding, graceful columns and legs, similar to the palace tower . This is not surprising, because all the furniture is a historic replica. Each piece is carefully developed in accordance with the era. Designers Angelo Cappellini scrutinize historic interiors, then to create an exclusive furniture. Because all of the furniture is made exactly the same as the existing furniture in the Palace. In Angelo Cappellini with stunning accuracy recreate the interiors of the XVII-XIX centuries. Five famous classical styles–“Louis XV“, “Louis XVI“, Baroque, Biedermeierand Empire — inspired the designers to create unique collections of bedroom furniture. All bedroom sets, produced by Angelo Cappellini, called in honour of legendarycomposers (Bach, Mozart, Chopin and Debussy, Vivaldi and Paganini). And this is no accident — after all, what’s better than music, shows us an eternal timeless classics? In this gallery we offer you to look like a luxurious Italian bed manufactured by AngeloCappellini — 32 fine model, a variety of styles and finishes. The most remarkable example of this style is to us a collection of Brahms. High softheadboard is upholstered with high quality fabrics and embellished with decorative“Tiara“, carved legs gently outline the gilding. A Boito has the same smooth outlines,but looks lighter and ženstvennee thanks to the elegant form and Crimson upholstery.Contrasts with her series of Pergolesi, emphasized the “concise and courageous“. If you admire a headboard with collections–Capito Frescobaldi luxury bed will be a worthy choice. 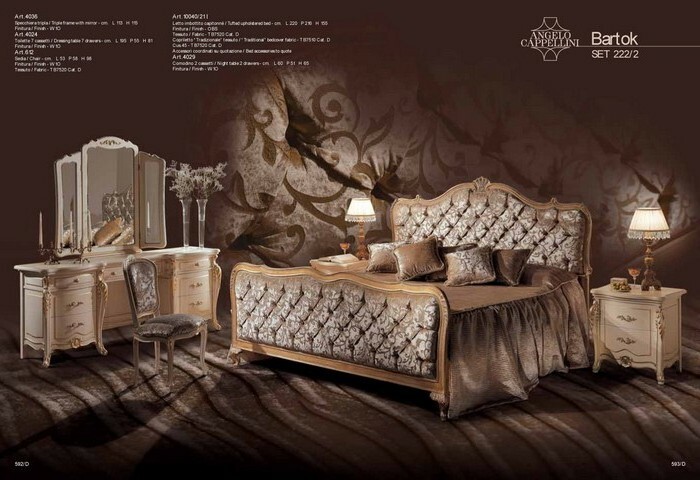 Its headboard and footboard are upholstered with expensive cloth,stitched and decorated with Golden stucco frame. You believe that luxury should not be ostentatious, and graceful and delicate? Note the bed Strauss in which gilding is elegantly combined with white upholstery, thin frame and smooth contours. Series “Louis XVI» are such smart headset as Mozart. Headboard and footboard of the bed upholstered with golden curls, making it a truly luxurious. Of course, the collection has a bed and Salieri. It has a more muted colors in the decoration, but also a certain solemnity and pomp. Another nifty duo of white and gold – set Chopin, trimmed with bright paint, gilded carvings and classic fabrics. Or refined bed Cimarosa double headboard textile with gold ornaments.Satie bed does not look complicated, as the others, but it is only at first glance. Looking closer, we notice the exquisite gradation of shapes and patterns. The same can be said about the model Debussy, whose carved ribbons forced again and again to admire the creations of masters. And an interesting shape and bright fabric headboard Copland look festive, but at the same time did not pompous. In this series, the color of the mattress is made lighter. The combination of white gold and golden brown make your bed look very luxurious. Bright and solemn baroque style Italian designers did not leave indifferent. Luxury bed Albioni in intricate carved frame. Unusual cloven headboard models Bach. Stitch-Capito and a small “diadem” a luxury headboard Bartok. However, in this collection, there are more low-key model. Such Bed Vivaldi – a stunning contrast cream textiles and dark wood frame. Or Wagner in an elegant gray-blue dress and with moderate decor. Collection in the style of “Biedermeier” features simple but elegant form and the absence of any frills. Schubert and Ravel headsets vary considerably – colors, angles and smooth lines. But they both look real good solid classic that you can proudly pass descendants. Empire style, fantasy and intricate Imperial style of the early 19th century, found a worthy reflection in the works of the brand “Angelo Cappellini“. See, for example, on a wonderful bed Dvorak, in which incorporate decorative columns, carved monogramsand Capito. Or the more concise model of Paganini where strict columns crowning a series of carved flowers. For those of you who like luxury, perhaps all of the beds can be a model of the beds of your dreams. And you could feel the bed in the palace, like a king and queen.